I already have 3 problems with this post: 1) I hate beans; 2) It’s officially 71 degrees outside and therefore way too conventionally “warm” to post a soup recipe; and 3) Every idiot I’ve run across recently cannot pronounce the word “Chipotle.” Let’s take these one by one, shall we? First of all, I think beans are kind of pointless. Refry them and cover them in cheese and maybe we can talk, but for the most-part, I’ll pass. That is, AHEM, until I had this soup. The Chef brought this home from work for me months ago, and I don’t know if it was my intense love of getting anything for free or the Chipotle Cream on top, but it was GREAT. As for my second point, I have pointed out that soup knows no season on several occasions, so you can take it down the street to another blog if you don’t like it. And finally, the word is pronounced “Chi-poht-lay.” Yeah, I’m looking at you, Paula Deen, I love your wacky behind more than anyone, but “Chi-POLT-ay” just “ain’t rite,” to use your vernacular. You’re on the Food Network for goodness’ sakes. Get it together girl. 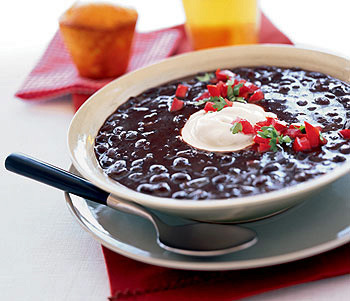 Rinse black beans in cold water. In a large pot, cook onions and peppers in olive oil until they become soft. Add the chili powder and cumin and stir until the onions are well coated. Puree beans in their liquid until smooth. Thin down with additional water, if necessary. Season to taste and top each bowl of soup with Chipotle Cream.